PERTH, AUSTRALIA – CHC Australia has appointed its first two engineering apprentices since February 2010, promoting two local Broome employees into the roles. Stuart Mackenzie and James Brown are CHC’s newest apprentices after successfully applying for the Diploma of Aeroskills (Mechanical) apprenticeships at the Broome base. Prior to the apprenticeship opportunity, James was a long-time ground crew employee who returned to CHC earlier this year after a short stint away and Stuart worked at CHC as a ramp assistant for just under a year. Stuart and James commenced their apprenticeships in the past fortnight and will take the next four years to complete their training. Diploma level mechanical technical stream units covering advanced fault diagnosis and aircraft weight and balance calculation. The two ramp assistant positions were backfilled with local Broome residents Karen O’Connor and Ronald Murphy. They started in their roles earlier in October. On 16 October, Aviation Australia, the appointed training organisation, MEGT, Apprenticeship network provider, and CHC’s maintenance leadership were in Broome to register James and Stuart into the Apprenticeship program. CHC’s next apprenticeship intake will be around May 2019, with two additional Engineering apprenticeships places expected to open. 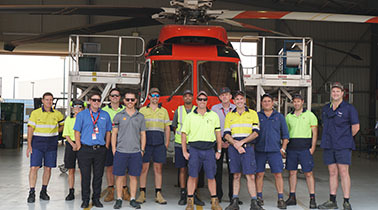 For more than 70 years, CHC Helicopter has provided safe, reliable, cost-effective helicopter service in some of the most remote and challenging environments around the world, including more than 40 years in Australia. With extensive experience transporting customers in the oil and gas industry, supporting search-and-rescue and EMS contracts, and providing maintenance, repair and overhaul services, our dedication to safety and reputation for quality and innovation help our customers reach beyond what they thought possible. Visit www.chcheli.com for information.